When it comes to mortgages, it seems like everyone is curious about the same few data points: credit score, loan-to-value (LTV) ratio, and the purchase price of the loan. So we thought it would be interesting to pull all of our loan data from Marksman in 2014* and illustrate each state’s average FICO, LTV, and purchase price, and give you a glimpse of what the numbers look like across the country through the eyes of our pricing engine. 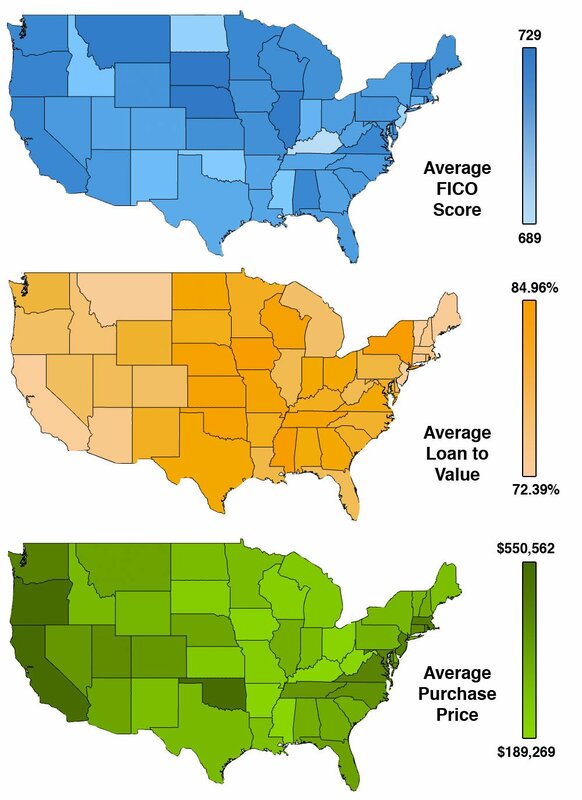 Looking at average FICO scores, the data indicates that Midwest states like Nebraska, South Dakota, and Montana had the higher FICO scores, while states in the south and eastern part of the country had lower scores. The only two states that didn’t average a FICO score above 700 were Kentucky and New Jersey. Finally, we look at purchase price, which has arguably the most even spread throughout the country. You’ll notice darker colors on both coasts than in the middle of the country, which correlates to the typically higher cost of living in those areas. The three lowest average values are all within southern states, Mississippi, Kentucky, and West Virginia, indicating slightly lower purchase prices across that specific region. *Statistics taken from Marksman internal data.